Old-fashioned, delicious and easy to make describes this yummy dessert. It’s wonderful served with ice cream. Preheat oven to 375°. Place peaches in a greased shallow 2-1/2-qt. baking dish. 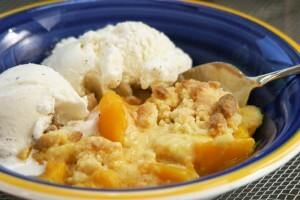 In a small bowl, combine brown sugar, flour, lemon juice, zest and cinnamon; sprinkle over the peaches. Bake 35-40 minutes. Serve with ice cream.